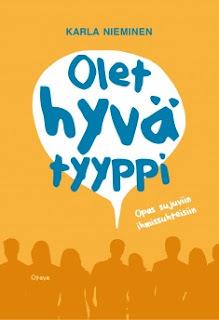 "Olet hyvä tyyppi" is a Finnish way of saying someone is a decent person, good company and an overall good guy. It's something of a coveted title. When you discuss recent job openings with a friend, they might say that it's not enough to have the technical expertise, but you also need to be a "hyvä tyyppi". When you describe your new girlfriend to your parents (and she's not there), you say that she's pretty but she's also a "hyvä tyyppi": dependable and genial. The latter is far more likely to impress them. "Olet hyvä tyyppi" is a guide for better social encounters and relationships. It's a book that I wish I had read five or ten years ago. I had the same kind of engineer attitude to social encounters as the author. Small talk for me was never natural, so I had to come up with a set of rules to follow, if someone caught me off-guard. Reading this, I'm reminded of those first years, when I had to learn it all for myself. This book is a good resource for someone wanting to become better around other people. But I was happy that it never veered towards making yourself better at the expense of others. A zero-sum game is not part of its vocabulary. A few things stood out. Karla Nieminen's sense of humor is effortless and surprising. She's able to sneak a few great lines in the advice and it genuinely made me smile. An American style version of this book would present the author as an unfaltering relationship guru that has all the answers. Nieminen is much more earnest and human. She makes fun of herself and encourages you to not take yourself too seriously. It feels like she's saying: "I had to learn everything by myself and I'm still not perfect. But I'm happier now and you can be too." This book seemed to echo what I learned from Bruce Springsteen's memoir. People are almost never faking or putting on an act. When someone complements you, don't question them! When you show genuine interest in them, they will open up and your conversation will be much more lively. I didn't appreciate how different people are until I stopped questioning their intents. Letting go of this idea alone made this book worth the time. The question at the end of the day is how to make the advice stick. For Nieminen, the answer is simple. You need to practice your skills in the real world until they become second nature. I would like to add to that. Great advice often comes in the form of a story or an anecdote. I've learned some great lessons from novels like The Grapes of Wrath and Freedom, because they make a different kind of imprint in the brain than just saying "now you have to do X differently". So instead of only reading self help books, pick up some classic novels as well. The combination will probably put you on the track to becoming the "hyvä tyyppi" in your own life.